At first sight, you could be forgiven for being slightly underwhelmed by the appearance of the Teufel THX Select2 Cinema set. 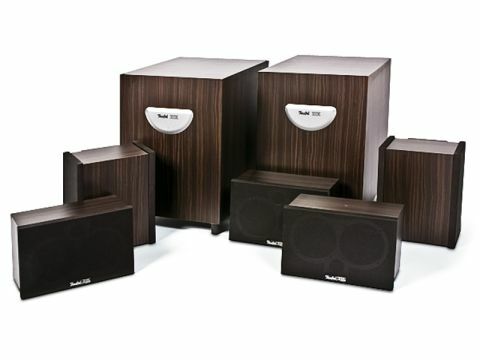 You get two whacking great cartons with full-size subwoofers inside (hooray) and five speakers no bigger than the regular bookshelves you might find in a kid's room (not hooray). Looks-wise, they are pointy and ugly and, despite the addition of some brushed metal bits, look cheaply-made. Of course, thinking like that is to miss the point in a big way, for these wear an 'I'm dead 'ard, me!' badge – otherwise known as a THX logo. Started, as the THX company now says, 'by a maverick director', THX was the brainchild of George Lucas, with audio whizz Tomlinson Holman being his main man. These days both George and Tom are no longer directly involved, but THX forges ahead. Its new versions of the 'Big Room' and 'Smaller Room' THX programs (which sprang from the original) are called THX Ultra2 and THX Select2, with Select2 intended for rooms up to two thousand cubic feet and viewing distances of ten feet. The Ultra2 specification is for the sort of bigger living space you find in American houses. There's even a THX spec limits musically. Part of the new THX Select2 spec is a range of new codecs, including one called THX Music, so it is possible that these speakers would sound better with music had I got a THX S2 front end. But I found a sibilance and softness that was definitely an artefact versus what purity I knew to be on the disc. Filmed in large chunks in the IMAX format, the soundtrack of Dark Knight has a serious level of difference between quiet parts and the most literally explosive. As the film begins, you get quiet and tinkly sounds, followed by a big smash, as the crooks set up a wire from one building to the next. The performance capabilities of the Teufel system suddenly became clear. Like a full set of bike leathers that make their owner look silly whilst doing the weekend shop, but badass when the dude is on his Ducati, these speakers, once fed a good slice of power, came to life and absolutely stonked. All that the THX certification implies is in there. Great directionality, superb placement of sounds around the room due to excellent off-axis performance, and a bass-end that is literally stupefying. However, the main five speakers do not seem that efficient, and I needed to crank ten per cent more than I normally would to get the satisfying reference level. At this point, the two 12in subwoofers, which had been left at the little mark that says 'THX' on the gain knob's marking, had to be turned down a touch by way of the LFE level from the remote. With that sorted, it was back to the film and, as the villains got offed one by one in the early sequences, I was beaten into joyful jelly – metaphorically speaking. When Batman thudded down onto the roof of an escaping van, I was almost lifted out of my seat. The system can go loud from quiet effortlessly. I also loved how well the subwoofers blended with the small speakers, without any trace of a 'hole' between the two sorts – impressive considering the size of the surrounds. The system arrived with one of the standard Teufel accessory packs; a hank of speaker cable and banana plugs, plus two phono cords to connect the twin subs up in different parts of the room. Each of the satellites has a pair of simple plastic brackets on their rear (in the form of short stand-off bars and 'L' shaped brackets on the dipoles). They're ready for wall mounting, but you can also get stand mounts should you wish. The L/C/R cabinets feature a pair of 4in mid-range drivers below a 1in tweeter. The rear-channel speakers are more elaborate, with a rear-firing 5in woofer and a mid-range driver and tweeter on other side. I found the grilles fall off if you touch them. Well, they did when I touched them. In fact, the boxes are clearly designed to be used without the grilles. They're essentially plain vanilla boxes with sharp corners, cheap-but effective binding posts and grilles with no fixings (nor Neodymium magnets to hold them on – which, I suspect, would've been costly). I get the impression that these have been made like a stripped-down dragster car – all performance and who cares how they look. Teufel makes far prettier systems, but if all you want to have is THX performance in your viewing room, these will do it for less than most. And you will either need cool neighbours or a detached home, as they do go very loud and with absolutely brain-splitting dynamics. So if you think speakers are just something to deliver surround sound, and you care not for veneers, curvaceous looks, or, erm, grilles that actually stay on, then the Teufel System 5 is probably the right package for you.